A Delta IV rocket, carrying the Parker Solar Probe, lifts off from launch complex 37 at the Kennedy Space Center, Sunday, Aug. 12, 2018, in Cape Canaveral, Florida. The Parker Solar Probe will venture closer to the Sun than any other spacecraft and is protected by a first-of-its-kind heat shield and other innovative technologies that will provide unprecedented information about the Sun. The scheduled launch of a rocket carrying a reconnaissance satellite into orbit from Vandenberg Air Force Base in Santa Barbara County that was originally scheduled for Friday and reset for Saturday was called off at T-minus 7 seconds due to a problem detected by the Terminal Countdown Sequencer Rack, according to United Launch Alliance. The launch was not immediately rescheduled. Prior launches from Vandenberg have created spectacular light displays over the Southern California and the southwestern United States. If liftoff had been successful Saturday, the launch would have been the second rocket to take off this week from Vandenberg AFB. Hawthorne-based SpaceX launched a Falcon 9 rocket from the base Monday, carrying 64 satellites into orbit. The latest launch is being carried out by United Launch Alliance, a joint venture of Lockheed Martin and Boeing. 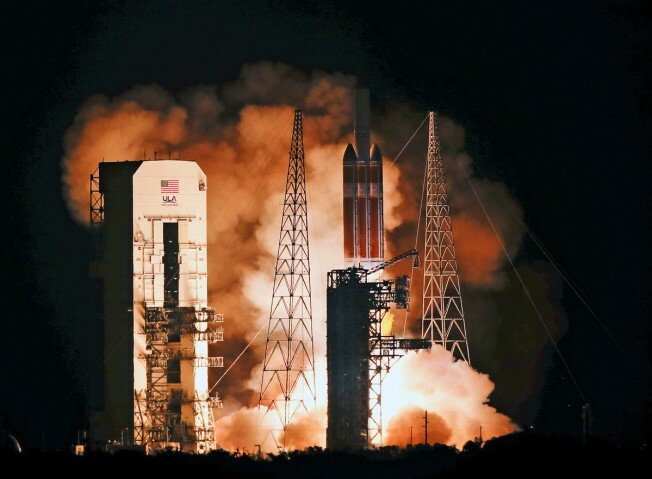 ULA's Delta IV Heavy rocket will carry a secretive satellite for the U.S. National Reconnaissance Office.